2nd time CBI filed closure report. CBI special court in Gaziabad will consider the case shortly. is cancelled. The IO of CBI is directed to further investigate the matter and file the report before the Court. The order issued by Shri. Alok Kumar Sing, Special Judicial Magistrate, CBI Gaziabad on 15-07-2014. I urge you to share this post to bring justice to my little brother. The IO tried to pressurise my father into signing an application which declared that he had committed suicide and said the investigation could only be proceeded with if he signed an application declaring this. Despite the immense amount of pressure the IO placed on my father, he refused to sign the application declaring that it was a suicide. The IO was completely uncooperative when we tried getting his cornea donated. They wasted 4 precious hours before the cornea could be extracted. My brother may have been killed. My family and I do not have faith in the UP police. The UP police force and Amity University are working hand in hand to cover up my brother's death. "We dedicate this website for all students who lost their lives in Amity University's various campuses"
A day after an MBA student was found dead in her hostel room in Amity University’s Gurgaon campus, she has been identified as Dana Sangma, 21, niece of Meghalya CM Mukul Sangma. 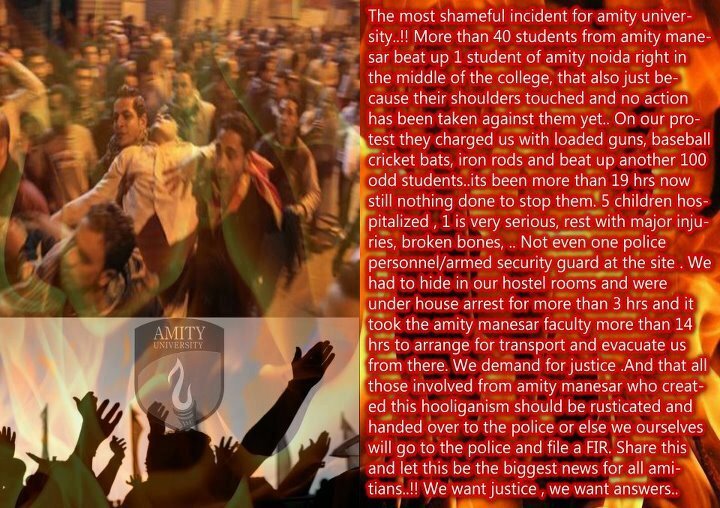 The city police on Wednesday registered an FIR against the university’s administration. In Shillong, CM Sangma described his niece’s suicide as a “result of discrimination” by the authorities of the institute. “Primary evidence suggests the girl was thrown out of an examination hall after the invigilator found a mobile phone with her,” Sangma said. The CM also said students from the northeast are subjected to humiliation by the university, which, he said, could also be true in the case of his niece. “This could have resulted in mental pressure that pushed the girl to take the extreme step,” he added. “There’ve been many instances of students from the northeast being subjected to all kinds of atrocities and discrimination,” Sangma said. 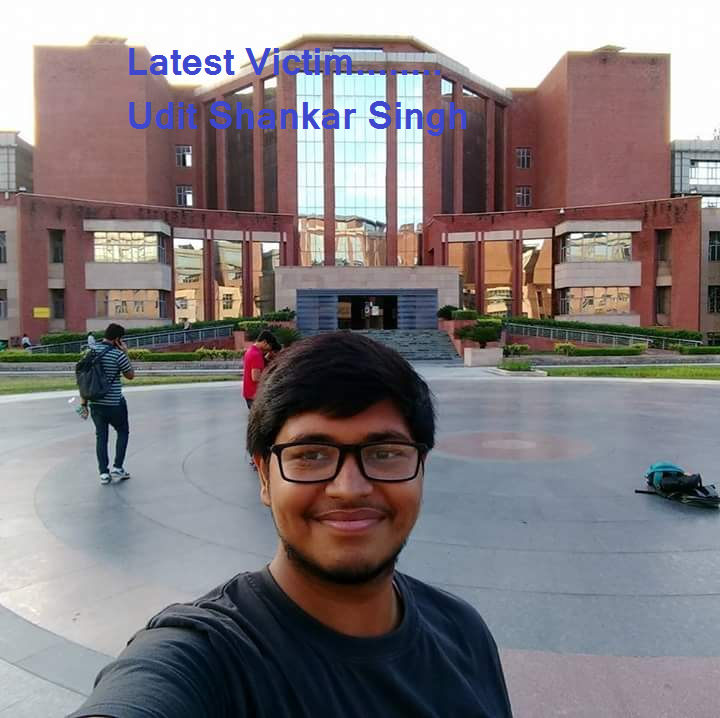 JAIPUR: It was a complete state of lawlessness at the Amity University campus along the Jaipur-Delhi highway on the intervening night of Tuesday and Wednesday as a mob of students vented their anger after one of the students was stabbed to death. 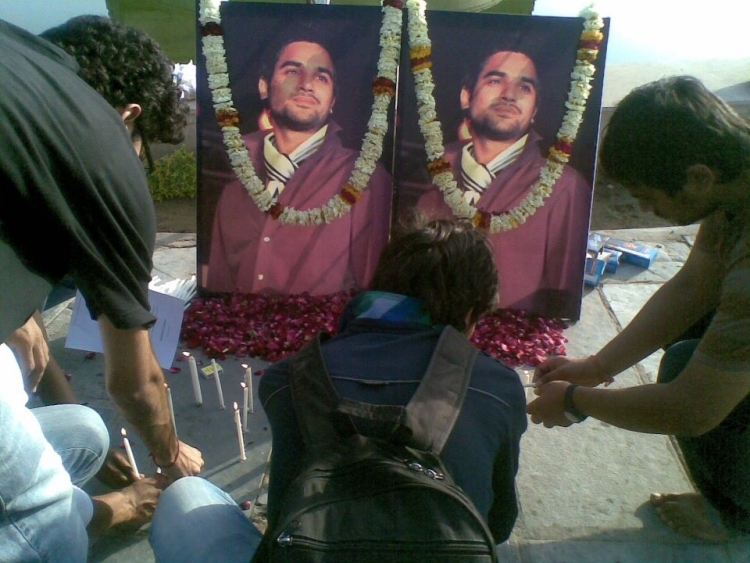 Around 200 students gathered at the main building protesting against the pro vice-chancellor for the delay in taking steps to save the life of 21-year-old Prashant Veer who was stabbed by a group of seven students from the same university inside the campus on Tuesday. In a matter of two hours, several portions of the university's swanky buildings were reduced into a pile of glass and debris. The angry students got a free hand in vandalizing as cops play it safe and merely watched from a distance. The mob left not a single glass window of the administration building of the business school building intact. They razed printers, fax machines, chairs, projectors that came in their way. The academy hall was spared as only the speakers and the curtains were destroyed.The protesting students claimed that that they had requested the VC to come out and issue a statement over the incident. "The V-C make us wait for one-and-half hour outside his office. Despite our repeated request, he didn't come out provoking us to take some extreme steps," said students requesting not to be named fearing di sciplinary action.Unconfirmed reports said that students have also damaged the VC's car. Saloni Bhatia's report in Pioneer,Delhi edition. Take the case of John Xavier who lost his only son Justin John Xavier in 2009. Justin was like any other 18-year-old — full of life, a swimming champion aiming to scale new heights. Sadly, on September 3, 2009, Justin’s parents received a heart rending call from his university authorities informing them of Justin’s untimely demise, due to drowning in the swimming pool! Justin’s aggrieved parents alleged a cover-up and criminal conspiracy. “What will happen to the common man in this nation? Justice has still not been delivered and its been three years of no one listening to us,” John, who works as a warehouse manager with an MNC in Saudi Arabia, said. John is planning to visit India in April to get justice for his son Justin who was pursuing a dual degree in aerospace engineering from a private university in Noida when he died. “It had been only a month since Justin had joined the university when authorities called to say he had died following a cardiac arrest while swimming. Justin was our only child. Our family ended that day on August 9, 2009. He was the one who would have carried on the family legacy. I have no brothers. I just have a sister who is childless,” a sobbing Xavier says. 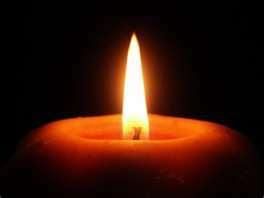 Justin’s post-mortem examination was conducted on September 4, 2009. The report stated that he had succumbed to asphyxia as a result of drowning. The report also noted injuries on his body. Since the report didn’t suggest any foul play, the police closed the case. However, John knocked the doors of various authorities to unravel the truth behind the mystery of his son’s death, finally getting a go ahead from a Kerala court for a second autopsy. This autopsy revealed discrepancies in the first autopsy. “The Government Post Mortem Centre, Noida, had not preserved Justin’s viscera which is mandatory in all cases. Without conducting a detailed examination of internal organs, including the lungs, brain and heart, the doctors at Noida concluded that Justin died as a result of asphyxia. The second autopsy confirmed our suspicions,” John tells you. The autopsy revealed contusions on the right side at the back of the head, the left side in front of head, right side of back of trunk and left side of middle of back of trunk. It was revealed that the cause of death was ‘a combined effect of head injury and drowning’. In lieu of this, the court handed over the case to CBI in October 2010 giving it a deadline of eight months. The CBI defaulted on the deadline and John filed a contempt of court petition in the Kerala court. In reply, the CBI filed the closure report in the Ghaziabad special court in November. The hearing on the closure report was held on February 24. “The CBI sought a third opinion from the Maulana Azad Medical College doctors and they rubbished the findings of the second autopsy,” John says. Another shocking news reported by experts that the first autopsy was improper or fake. (Re autopsy was conducted by Dr. Sreekumari, police surgeon assisted by a team of doctors in the presence of senior police officers.The entire process was video taped. Pro.Balaraman Nair is the most senior pathologist living in the state of Kerala. He is widely acclaimed as the best histopathologist in India and his microscopic diagnoses are considered as the most accurate. He presented a slide by slide detailed report which clearly indicates homicide. Head and kidney injuries reported. Further studies were carried out by Dr.Umadettan, head of forensic dept., Amrutha Institute of medical sciences. He is the author of several books in forensic science which are used by many experts for reference . 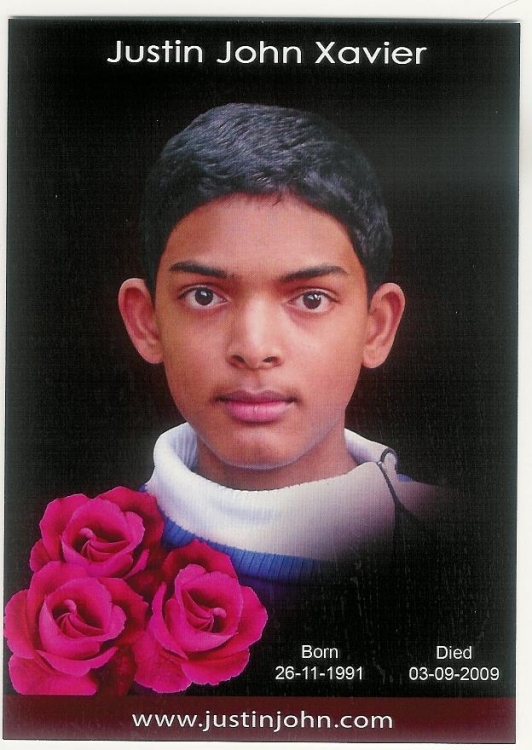 An expert swimmer and basket ball player, with a height of 184cms drowned in shallow waters of Amity swimming pool. 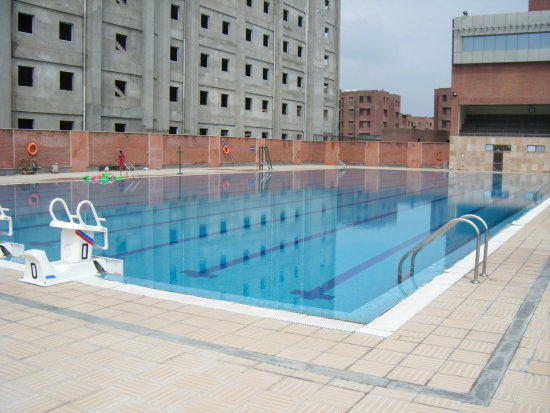 Depth of the deep end is 6ft and the place he drowned is less than 5ft . 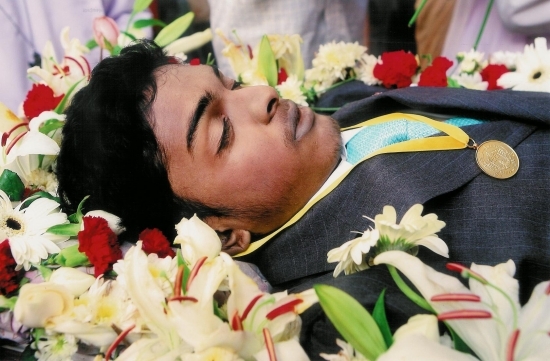 According to Amity Justin drowned for less than 15 seconds in the presence of many students and life guards. Re autopsy revealed head and kidney injuries with a blunt object. How an unconscious boy was carried to swimming pool without the knowledge of concerned authority?